Enrollment in the federal food stamp program, known as SNAP – for Supplemental Nutrition Assistance Program – has more than doubled over the past decade to 47 million. What’s remarkable is that for the first time the number of Americans receiving food stamps increased even in a period when the economy was growing. During the 2003-2007 expansion, the SNAP case load, in a break with historic trends, rose 24 percent. One explanation is the change in the longstanding correlation between the unemployment rate and poverty, according to research findings by economists Matt Rutledge and April Yanyuan Wu of the Center for Retirement Research, which were presented at the Retirement Research Consortium meeting in August. Poverty used to fall in tandem with the jobless rate, reducing the need for food stamps. But the researchers found that the mid-2000s expansion was different: poverty did not decline as the economy grew. In the recovery that has followed the Great Recession, the number of people receiving food stamps continued to rise, according to federal data. 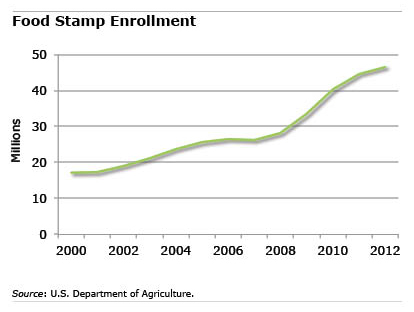 The assumption has always been that a stronger labor market will reduce the need for food stamps. But this new trend suggests rising employment might no longer be enough. Reducing the food stamp rolls may require a broader recovery or initiatives to reduce poverty and provide more jobs for the marginally employed. Video: Mutual Funds or Designer Shoes? Prithi Gowda’s animated video was one of two winners in a competition among New York University film school students and alums to produce a video that would turn young adults on to mutual funds. The winners were awarded a trip to Monaco to premier their work. The filmmaker practices what she preaches in this short animation, “Frenemies.” Gowda’s freelance work as a website designer and videographer for Wall Street firms has allowed her to build up “a nice, comfortable savings.” Investing, she said, has given her the freedom to start her own company, 21st Street Projects in Manhattan. New research shows the share of Americans who lack enough ready cash on hand for emergencies shot up in the aftermath of the Great Recession. 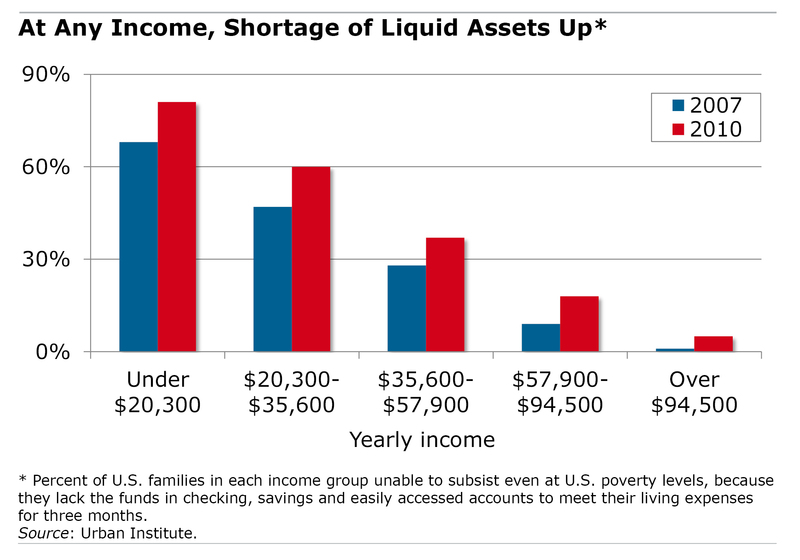 These families do not have access to the liquid assets – cash or funds in their checking or savings account – to cover emergencies like layoffs, health crises, or even car repairs, according to an analysis of federal data by Caroline Ratcliffe of the Urban Institute, who presented the finding to the Congressional Savings and Ownership Caucus in late September. Ratcliffe’s measure of financial fragility was families who did not have enough liquid assets to subsist at federal poverty levels for three months. That amounts to $2,873 for a single person, $4,883 for a family of three, and $5,888 for a family of four. By this measure, 37 percent of families in the middle income group – earning $35,600 to $57,900 a year – in 2010 were financially fragile – up sharply from 28 percent in 2007, a year before the Great Recession began. No income group was spared by the downturn: in most cases, the share of families at risk increased between 9 percentage points and 13 percentage points. Ratcliffe said that financial problems can cascade if cash-poor families resort to high-cost loans or credit cards to pay their bills, and building wealth becomes extremely difficult. Husband, wife, grandmother, uncle, elderly friend – we all need a devoted caregiver when we grow old. But in a not-distant future, according to a new report from the AARP’s Public Policy Institute, the number of family and close friends available to fill this demanding role will decline sharply. It’s unlikely there will be enough of these unpaid caregivers for the multitudes of aging baby boomers. Today, there are seven Americans between the ages of 45 and 64 for each individual who is at least 80 years old. The baby boomers, largely because there are so many of them, have done a good job of caring for their parents born during the Depression era. One surprising result has been a steady decline in nursing home occupancy rates. But AARP estimates that the number of folks age 45 to 64 for each individual at least 80 will fall from seven today to six in 2020, four in 2030, and three in 2050. Worse still, not all of them can or will fill the role of caregiver. Upon retiring, you suddenly have access to a chunk of money that’s been accumulating in your 401(k). It’s easy to make a move that incurs unfamiliar tax consequences or otherwise jeopardizes your hard-earned savings. Social Security – how does your monthly check vary, depending on the filing age you select, and how can you and your spouse determine the best strategy for getting the benefits you’ll need? Your employer – is an annuity an option in your 401(k) plan, or how much can you expect to receive per month from a defined benefit pension? A fee-only planner or other financial resources – what are your priorities and options; how much retirement income do you need; do your Social Security, 401(k) savings, and employer pensions generate enough income, and with how much risk; should you delay Social Security to increase your total monthly income; and should you purchase an annuity to cover your fixed expenses? There’s a bright line between an impulse purchase and compulsive spending. When something new catches her eye, the impulsive buyer snaps it up and enjoys the splurge. There is no such enjoyment for the compulsive buyer. The act of buying temporarily alleviates her anxiety but she inevitably feels guilt or regret. A new study explores the childhood experiences that lie at the root of why some people – women more than men – develop these damaging spending problems, which can lead to enormous debts and derail plans to save for the future. There are now two reasons to postpone retirement. The financial reason has been covered repeatedly in this blog: working longer increases a retiree’s savings and monthly Social Security income, while shortening the number of retirement years that their savings will have to fund. If that doesn’t convince you, here’s the other reason: working longer may prevent dementia.